Does Your Nonprofit Website Instill a Sense of Hope? The nonprofit web space, in general, isn’t where it needs to be. Sure there are shining examples of nonprofit organizations using the web in beautiful, inspirational and groundbreaking ways. But given the importance of the work done every day by nonprofits worldwide, the digital nonprofit space simply isn’t good enough. I’m sure you’ve heard about numerous things you need to include in your nonprofit’s website in order to be successful: a strong dose of social media integration here, a bit of responsive design there, and a pinch of storytelling infused with strong calls to action. In many cases, the inclusion of such features will certainly be beneficial. But there’s another key ingredient when it comes to upping the nonprofit web space. We need more hope. Hope is an often-missing, easily overlooked piece of the nonprofit website but is crucial to telling your story in a compelling way. It helps inspire your website visitors to action by playing a couple of key roles. First, hope establishes that the problem is solvable. Most nonprofits are organized around solving a problem. Maybe it’s improving access to healthy food or boosting educational opportunities for kids. Whatever the problem, a healthy dose of hope shows that the problem has a solution. A problem that appears unsolvable isn’t motivating. It’s daunting, overwhelming, and maybe even debilitating. Our job is to inspire visitors to action, not dim their spirits and immobilize them with despair. Hope makes taking action seem worthwhile. In addition, hope establishes your organization as a solver of the problem. Showcasing the hope your organization has demonstrates the idea that not only is this problem solvable, but you’re a significant player in the implementation of the solution. Positioning yourself in this way makes it much more likely that potential supporters will get involved with your organization. If they’re looking to tackle the problems you’re addressing, your nonprofit will appear as a vehicle to do so. So we know hope is important. 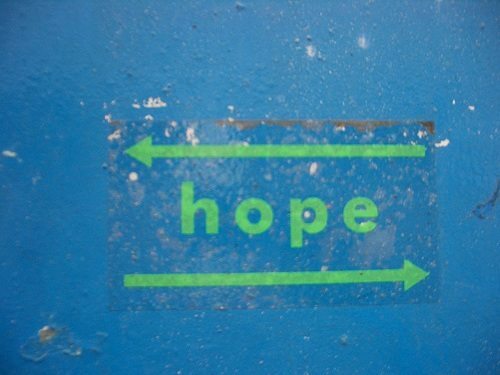 Now let’s focus on tangible ways you can integrate hope throughout your nonprofit’s website. Begin by incorporating at least a bit of hope into every page of your website. Don’t stop at the point of establishing the vastness of the problem. Share your solutions as well. This isn’t some sort of marketing gimmick to get more donors or volunteers. It’s a shift in the way you communicate the role your nonprofit is playing in the world. Every page on your website should inspire hope and compel your visitors to get involved in whatever way feels right to them. Remember to showcase your past impact. Sharing your past successes will instill confidence in your ability to do so again in the future. Be sure these examples of impact are easy to find no matter what page of your website a visitor is reading. Also, use stories about individuals. Data can be great to show the widespread nature of both the problem and your impact, but it’s easier for website visitors to emotionally identify with personal stories from individuals in the communities you serve. Doing so not only promotes emotional identification, but it also shows you’ve actually spent time in the community. A website visitor is more likely to trust an organization that consistently demonstrates that they know their community. Even better than telling stories about your community, let community members speak for themselves to tell their own stories directly. Share stories that not only illustrate the problem, but also highlight community members’ hope for a solution. Or talk with a member of the community you’ve already impacted in some way and have them discuss what your organization means to them. You can take this a step further by recording their responses and creating a video. Doing so will allow members of your community to speak directly to your website visitors. If you’ve been doing what you do for a while, use data to show the broader impact you’ve had in the community over a period of years. Coupled with individual stories, effective data can instill confidence in the abilities of your organization to create lasting change for those you serve. But don’t simply dump data on your website visitors. Explain the implications of the data in as tangible a way as possible. Outline not only what the numbers mean, but how those numbers represent concrete changes for individuals. Doing so will help make your data matter. Lastly, bring passion to your web content. Chances are you care deeply about what you’re doing. Show that passion when you write your web content. Organizations often err on the side of being too professional and wind up replacing much of their passion with stale web copy. Show you care about your mission. Get personal and talk about what it means to you. Your own passion will help excite your website visitors. Does your nonprofit website instill a sense of hope in your visitors? Or, as a visitor, have you come across a website that made you feel compelled to get involved? I’d love to hear your thoughts in the comments section below. David Hartstein is a partner at Wired Impact, a web development company that builds websites for nonprofits. He spends most of his time helping nonprofits tell their story in a more compelling way and using data to measure the benefits they can glean from their website. You can catch up with him on Twitter.